Pâte à choux, (also referred to as choux pastry,) is a basic French pastry paste made from flour, water/milk, butter and eggs. From the basic ingredients, other ingredients are added to transform the choux pastry into gougères (flavored with cheese), eclairs (sweet, rod-shaped, and filled with pastry cream), profiteroles (similar appearance to gougères but filled with pastry cream or ice cream), and even Parisian gnocchi. Choux pastry does not include a leavening (or rising) agent, such as baking powder or yeast. 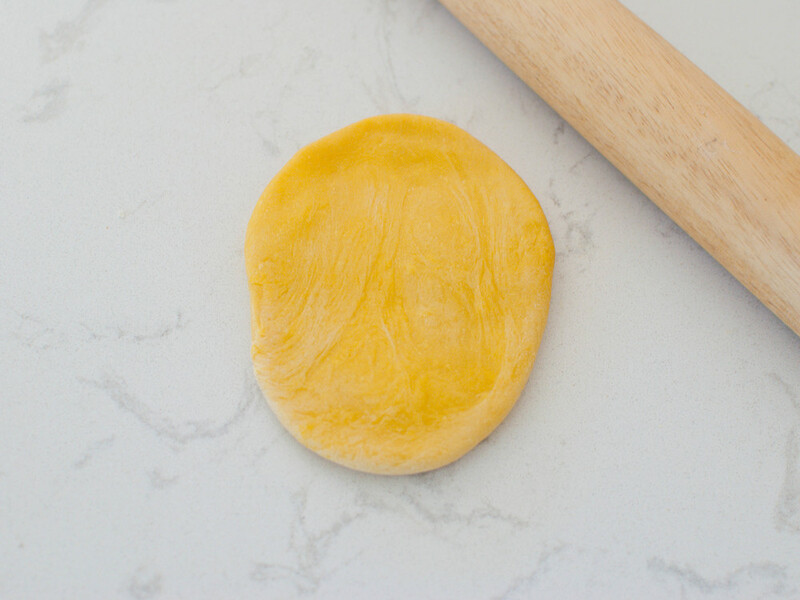 The piped pastry mounds puff during cooking due to the high moisture content of the soft dough, which evaporates and results in a golden pastry shell. 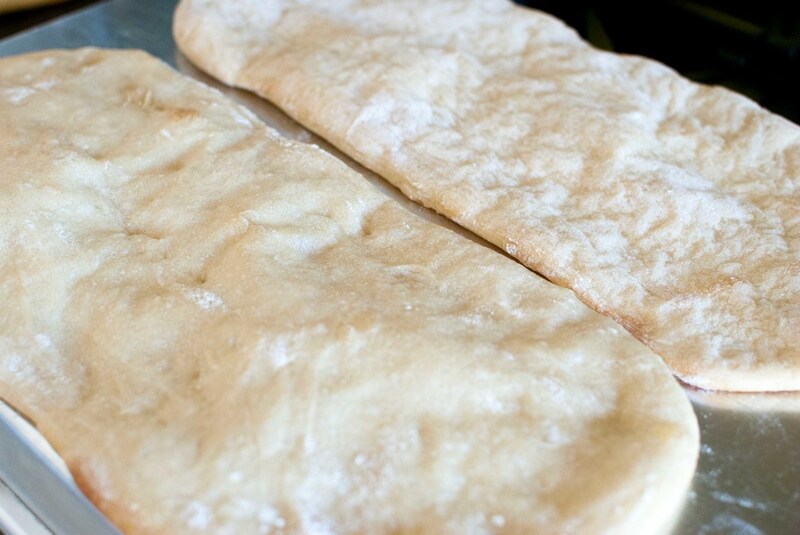 This is a classic, easy to master, and versatile dough that can be used in a multitude of ways. I encourage you to try it and never look back! Not to be dramatic or anything . . . but your life will never be the same once you can make homemade gougères. Notes: This recipe might seem daunting, but once you make it successfully once, (hopefully the first time,) you will feel like a rockstar. The most important thing to remember when it comes to this recipe, is to have everything prepared and measure before you begin. The steps move quickly, and there should be very little lag time between steps. You can substitute the milk for water and any kind of semi-hard and hard cheese will work, depending on your preference. I have made them with Parmesan, Gruyere, Comte, Emmental and Cheddar. In this instance, I used Dubliner, which I find multi-dimensional: nutty, sweet, sharp and salty. You can also jazz it up with herbs and other seasonings. Thyme is one of my favorite herbs for these cheesy, airy puffs. 1. Begin by preheating oven to 425 degrees and lining two sheet trays with parchment paper. 2. Meanwhile, bring milk, butter, salt and pepper to a boil of medium-high heat. 3. Once at a boil, turn heat down to medium and add flour to the pot. Stir vigorously, incorporating the flour into the milk mixture. 4. Continue to cook and stir until a cohesive, soft dough is formed (the dough will pull away from the sides of the pot). Once the dough has taken shape, continue to cook for 1 minute more, stirring constantly. 5. Add the mixture to a stand mixer bowl fitted with a paddle attachment (or a mixing bowl, or a food processor) and mix on low for 1 minute to release steam and cool down the dough. Add an egg, one at a time and mix on medium-low until it the egg has been fully incorporated (about 30 seconds to 1 minute). This photo has one egg and has been mixed for 10 seconds. The appearance of the dough is curdled and not cohesive. Continue to mix until it looks like the following photo. 6. 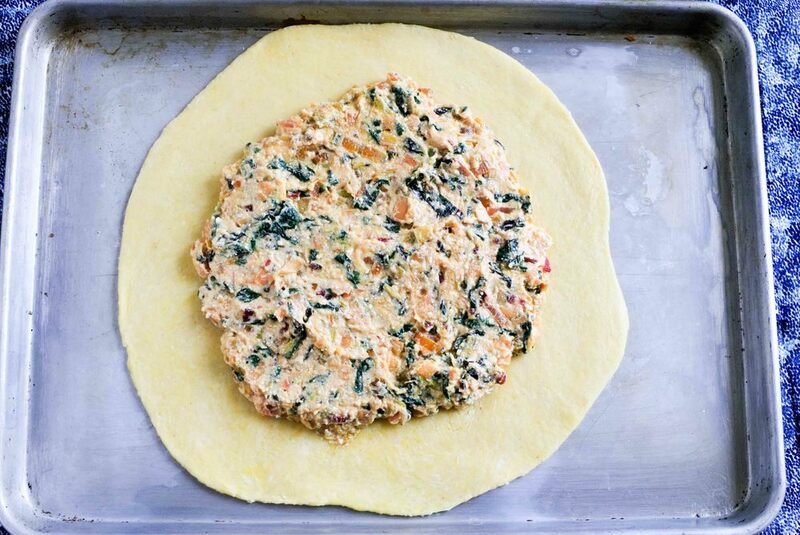 Continue adding the remaining eggs until the dough resembles this constancy. 7. Add shredded cheese and fold in. 9. Squeeze dough to a bottom corner of the bag and twist and pinch the bag at the top of the dough to create pressure. Snip the corner to approximately the diameter of a dime. 10. Standing directly above your prepared baking sheet, position the tip of the bag to kiss the parchment. Gently squeeze bag from the top, releasing the dough, while simultaneously and slowly drawing the bag upwards. 11. Continue piping mounds on the baking sheet with 2" of space between each one. 12. Dip your finger into the egg wash and gently push down each of the unruly tails that formed on your mounds. With a pastry brush, brush the top of each mound with egg wash.
13. Sprinkle finely shredded cheese on top. 14. Place baking sheets into the preheated oven, with the racks positioned at 1/3 and 2/3 distance. Bake for 15 minutes at 425 degrees. Carefully turn the pans in the oven to ensure even cooking. Be gentle! You don't want to bang them around and have any collapse - they are still fragile at this point. Turn oven down to 375 degrees and continue to cook for 10 minutes more, until beautifully golden brown and hollow on the inside. Enjoy immediately or store in an airtight container, and rewarm in a 350 degree oven for 8 minutes. 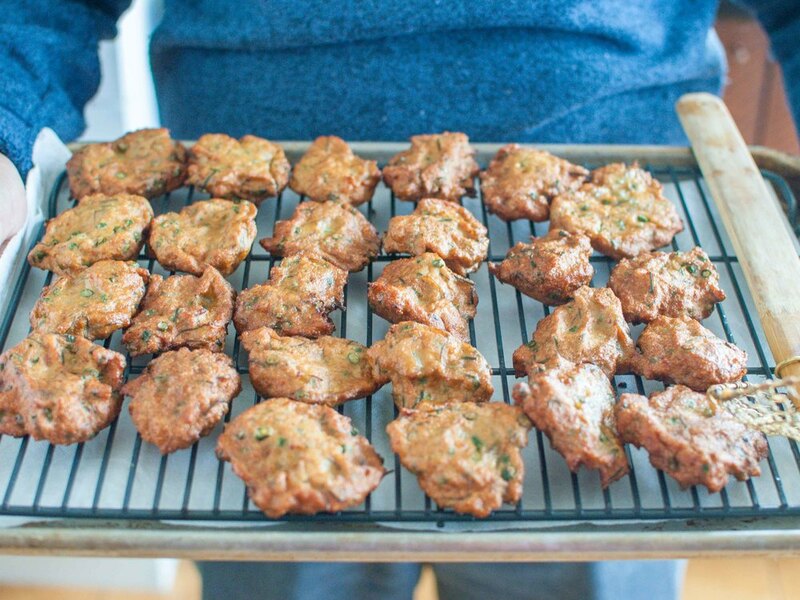 These crispy, spicy fish cake fritters are so fun to eat! They are perfectly sized for a shared appetizer or for the fingers of little children. 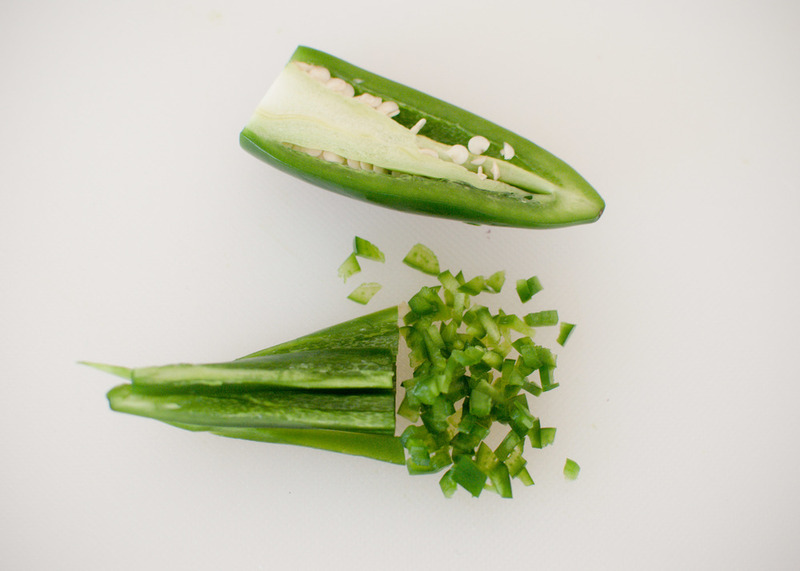 We made them less spicy for the preschool-set, but feel free to adjust to your fiery tastebuds' delight. 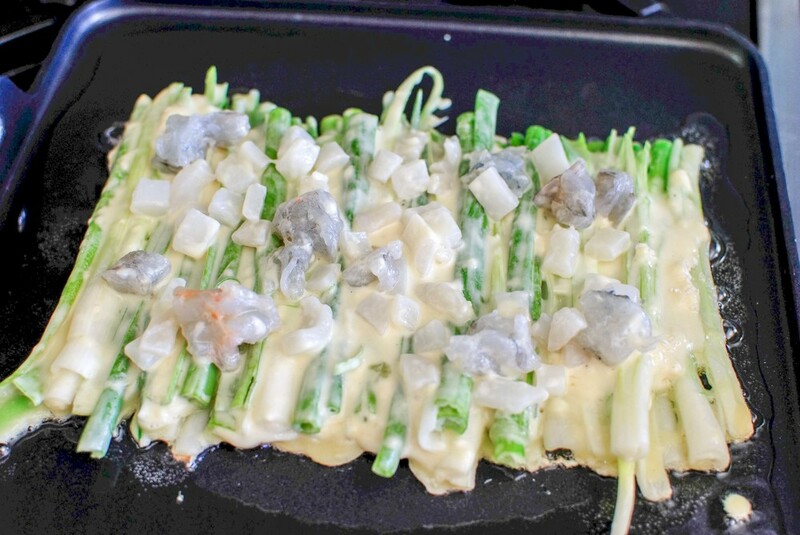 The long beans add a bit of extra texture to the fritters, and the cucumber relish infuses each bite with sweetness, tanginess, spiciness, and crunch! Notes: Since the heat and saltiness of curry pastes and fish sauce can vary a lot from brand to brand, I recommend frying a little tester patty to see how it tastes and then adjusting the seasonings to your liking. Start with the smaller amounts and then ratchet up from there. Long beans are found in Asian grocery stores, but you can substitute green beans if you can't find them. Fish paste is found at the seafood counter or frozen section of Asian grocery stores. 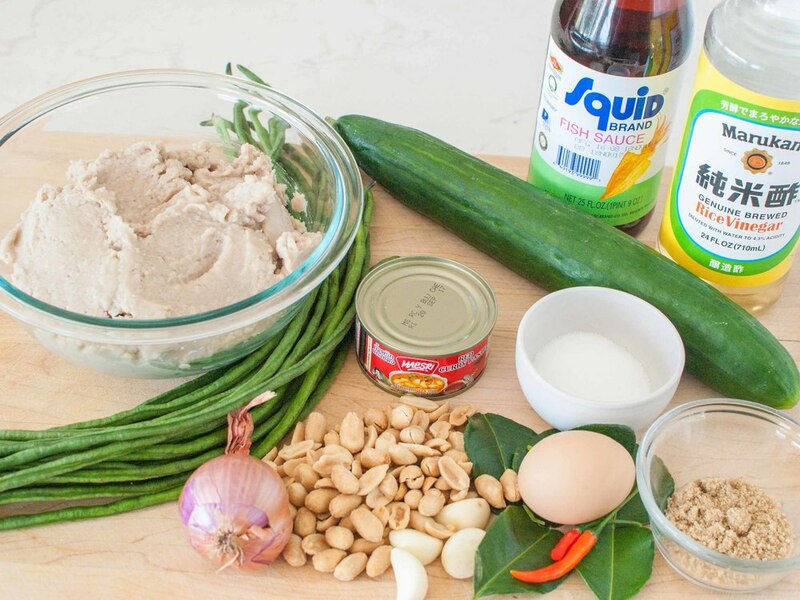 If you can't source already prepared fish paste, you can make your own at home. Buy any firm white fish fillet - grind it up in a food processor or blender with 1-2 ice cubes until you have a fine paste. Combine all ingredients in a large bowl. Stir well until ingredients are evenly distributed. Heat oil over medium-high heat. You will need about 3 inches of oil for frying. Drop a small amount of fish mixture into the hot oil and fry until brown to do a taste test. Different brands of curry paste and fish sauce can vary in saltiness and intensity. 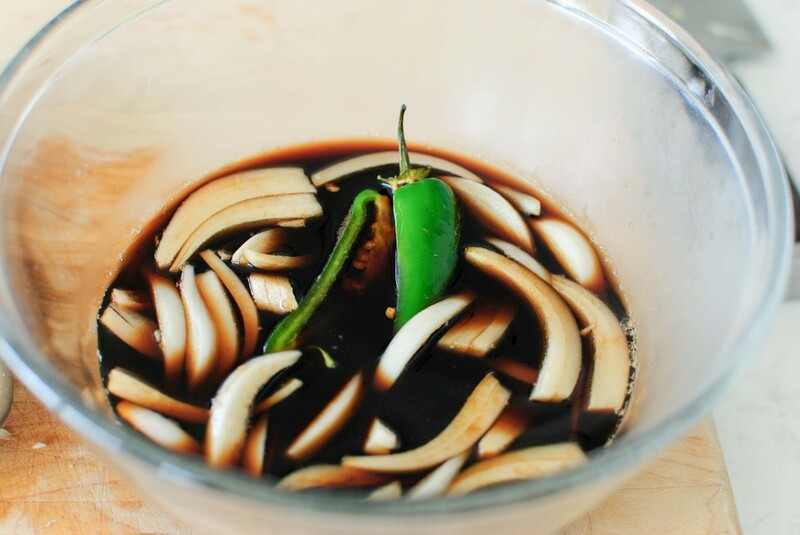 Adjust the seasoning to your liking - more curry paste to make it spicier and more fish sauce to make it saltier. Set cooling rack over a paper-towel lined baking sheet, and set aside. Set a small bowl of water and fish mixture near the stove. Use the water to wet hands. Spoon about 2 tablespoons of the fish mixture into your hands (roughly the size of a golf ball), and flatten into a patty (⅓-½ inch thick). Carefully drop patty into the oil, and repeat, being careful not to overcrowd the pot. Fry the patties until they are puffy and brown. Remove from oil and drain on the prepared rack. Devour Tod Mun while still hot, topped with Cucumber Relish. Combine all ingredients in a bowl and stir well. Taste and adjust seasonings. Cucumbers will release a lot of liquid, which creates a sauce for the Tod Mun. Let sit for at least 10 minutes before serving. Notes: Rinse mussels well under cold water, scrubbing if needed. Pull out any beards by grabbing them and pulling towards the hinge-end of the mussels. (The beards look like little hairs poking out from between the shells.) Throw out any cracked mussels or open mussels that don't close when tapped with another mussel. Melt 2 tablespoons butter in a large saucepan over medium-low heat. Add onion, fennel, and garlic. Season with salt and pepper and cook, stirring, until vegetables begin to soften (about 5 minutes). 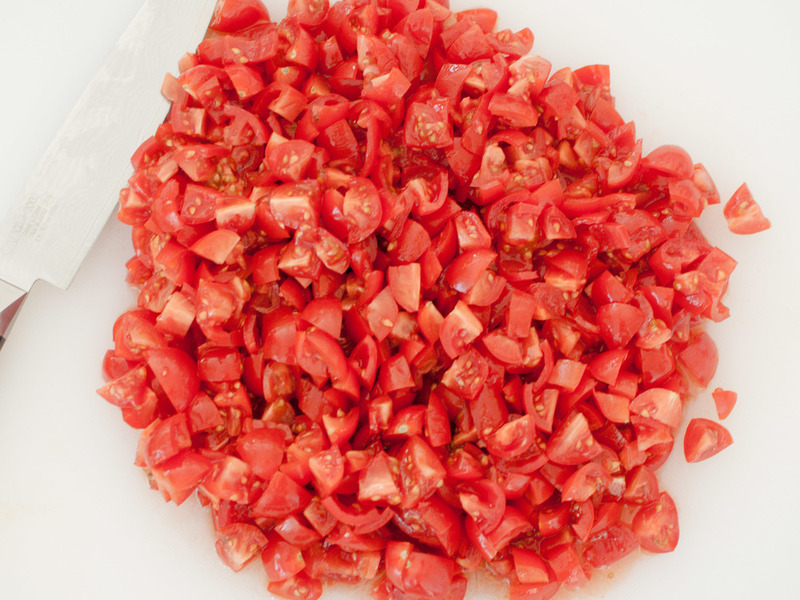 Add tomatoes and continue to cook until all vegetables are soft but not browned, about 5 minutes more. Increase heat to high and add wine. Bring to a boil and let reduce by half, about 2 minutes. Add mussels, stir, cover, and cook, shaking pan constantly and peeking every 30 seconds to stir. As soon as all the mussels are open, transfer mussels to a bowl using tongs. Place pan lid over bowl to keep mussels warm. Remove from heat and whisk in heavy cream. Return mussels to pot, add parsley, lemon juice, and lemon zest, stir to combine, then transfer to a warm serving bowl. Serve immediately with crusty bread. Fondue is so fun to eat! Who can resist crusty bread dipped into a pot of ooey-gooey, unctuous cheese? No one, that’s who. (Unless you hate cheese, in which case, I’m sorry- we can’t be friends. Just kidding . . . maybe.) Twirling bits of food into a pool of melty goodness is somehow therapeutic and it also bonds you with those dipping with you. Added bonus: My 4-year-old got a big kick out of dunking his broccoli and carrots into the cheese sauce, and he probably ate a week’s worth of veggies in this one meal alone. Notes: This is a fairly classic fondue recipe, but make it your own by using any combination of good melting cheeses, liquid, and flavoring. For example, you could substitute smoked cheddar, hard apple cider, and apple butter for a completely different fondue. Or how about extra-sharp cheddar, beer, and bacon bits? You get the idea! In a medium bowl, evenly coat the cheeses with cornstarch. Gradually stir in the cheese, one handful at a time. 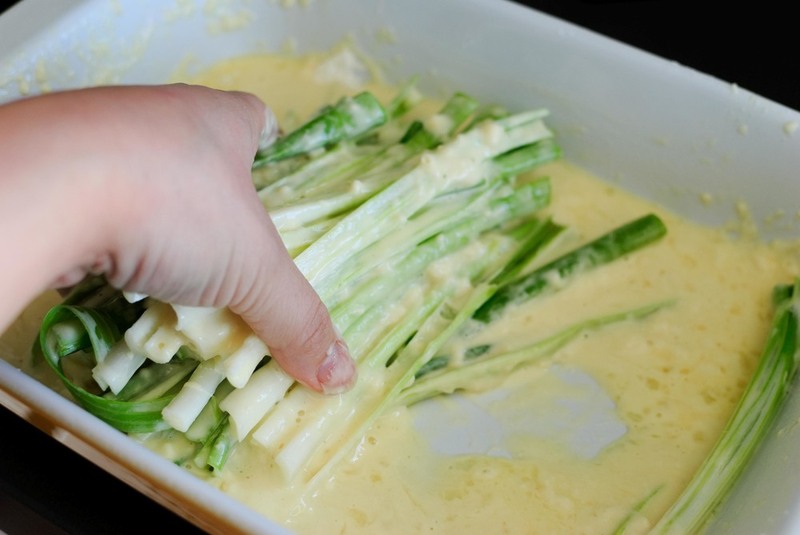 Stir each handful of cheese until it is completely melted, before adding another handful. Do not allow the cheese to come to a simmer. Once you have a smooth, glossy cheese sauce, stir in the lemon juice and kirsch, if using. Season with freshly ground pepper. Pour fondue into a fondue pot to keep it warm. Choose your dippers, dunk and swirl into the cheesy goodness, and enjoy! Small chicken wings are 33% meat, 33% skin and 33% bone - the best part being the skin. When chicken skin is rendered down from it’s pale, dotted and limp original state, it transforms into a golden and crunchy treat from the heavens. If you are #blessed enough, the fat from the skin might pool at the bottom of your baking pan to produce schmaltz. (Have you ever dipped a bland and dry veggie sandwich in warm schmaltz to make it palatable? I have, and it was glorious.) Chicken wings are a crowd pleaser and can be enjoyed hot and cold, which is why I thought they’d be a wonderful accompaniment to the Soba Noodle Salad with Ginger Scallion Sauce. The lacquered and addictive sweet and salty glaze was especially popular with the kids who loved nibbling off of the chicken bone. Notes: The chicken wings I bought were smaller than what I normally encounter at the store. But because of my love of chicken skin (see above) this didn’t bother me. The size of your chicken wings will change the amount of time you bake them. The meat on my small chicken wings were a little dry but the skin was incredibly crisp and was not compromised and didn’t get soggy when dressed with the glaze. This was worthwhile to me, but your mileage may vary. Bring all ingredients to a boil in a small saucepan, stirring to dissolve honey. Reduce heat to low; simmer, stirring occasionally, until reduced to 1/4 cup, 7–8 minutes. Strain into a small bowl. Let sit for 15 minutes to thicken slightly. 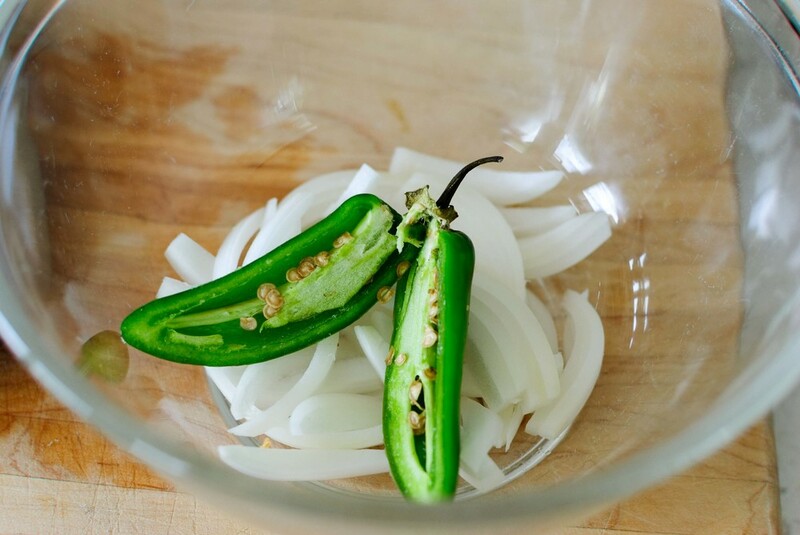 Add a pinch of red pepper flakes, if desired and squeeze 1 teaspoon of lime juice into sauce, mix and reserve. Preheat oven to 400°F. Set a wire rack inside each of 2 large rimmed baking sheets. 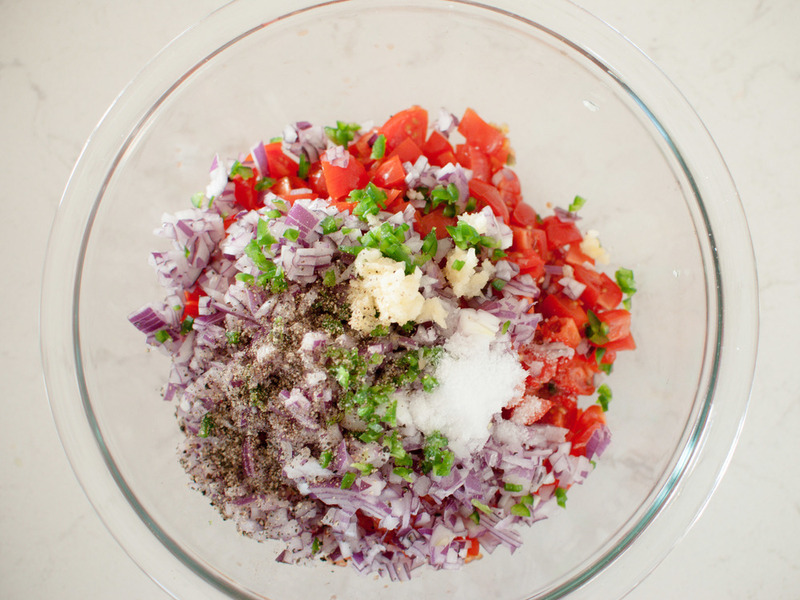 Place all ingredients in a large bowl; toss to coat. Divide wings between prepared racks and spread out in a single layer. Bake wings until cooked through and skin is crispy, 45–50 minutes. Line another rimmed baking sheet with foil; top with a wire rack. Add wings to ginger-soy glaze and toss to evenly coat. Place wings in a single layer on prepared rack and bake until glaze is glossy and lightly caramelized, 4–6 minutes. 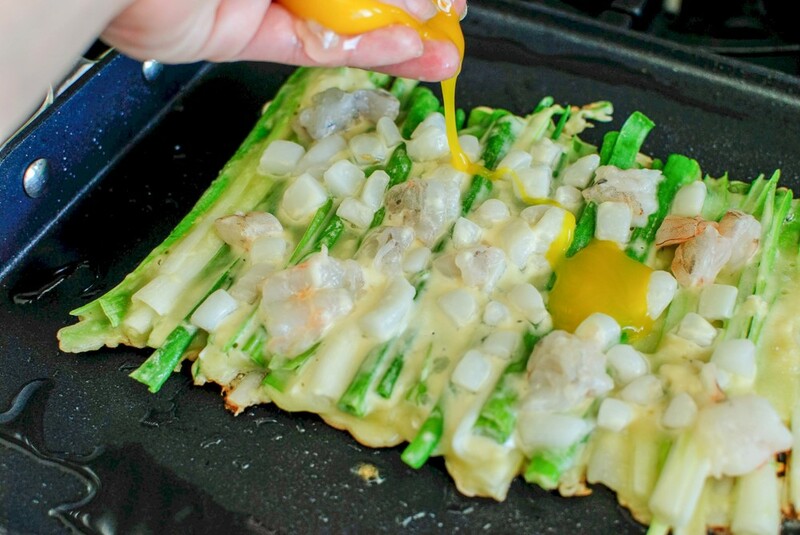 Garnish with scallions and sesame seeds if desired.